What goes with a bright orange lip? Well warm Fall colors like russets and golds would look good, but you can also swing the other way and do contrasting shades in bright tones. To keep things soft, I am using shimmer instead of matte, which would be a bit stronger. Step 1: I'm using a shimmery dusty-purple for the outer 2/3 of the lid. Step 3: Line the upper lash line with a purple pencil (Bourjois Regard Effet Metallise #78 Bleu Chatoyant). Add a pale golden green pencil (Bourjois Contour Clubbing Liner #44 Golden Grey Session) to the lower lash line. This look layers mulitple shades of silvery purples for a look that's monochromatic but not monotonous. If you own Lime Crime's Chinchilla lipstick or like that middle-ground between purples and greys, this is a look that goes with it. Step 1: Apply MAC Shale, or any smoky grey-purple to the two outer corners of the eyes, and along the lower lash line. Step 2: Pack a soft silvery violet in the centre. MAC Crystal is a beautiful option because it's a duochrome light grey with a violet sheen. 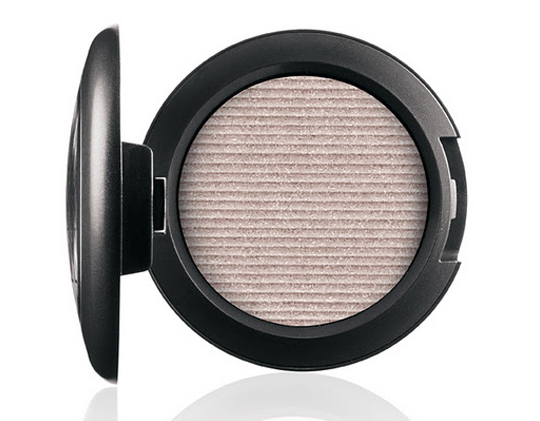 It's not the most pigmented shadow around, so you will need to pack and layer a few times to build up intensity. Step 3: Deepen the corners with a touch of Grape pigment (I'm using the limited edition Crushed Metal version, but you can use the normal one). Step 4: Dip the brush tip into more grape pigment and then smoke out the edges of the eye look. Step 5: Using a blunt tipped detail brush, apply a deep metallic purple gel liner (MAC Macroviolet) thickly along upper and lower lash lines. Build up the line so it looks thick and solid. Leave out any flicks and the outer corners. Step 6: Curl lashes and apply mascara. Then dust a translucent glittery violet to the brow bones and tops of cheek bones. Some of you may recall a few months ago, I posted about Lime Crime's limited edition Chinchilla lipstick, which is the unlikeliest and most unexpected shade of grey. Well what does a girl do on Cyber Monday while stocking up on staples like Great Pink Planet and Countessa Fluorescent? She drops an extra "experimental" lipstick into her cart for the heck of it. Well that experiment took a long time to ship, but has finally arrived. When I opened the tube, I wasn't too sure what to make of it. The first thing I thought was, "This isn't really grey." Well, it is, kinda. I would describe it as a smoky lavender. Equal parts purple and grey. So I compared it to my other purple lipsticks for reference. 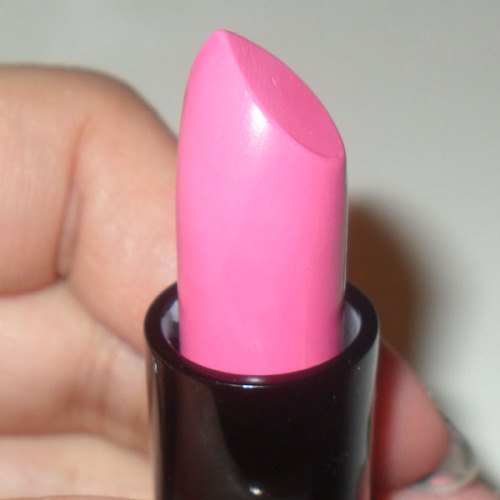 As you can see below, even NYX Power looks pink in comparison, so if you're not very comfortable with that shade on your lips, you will most likely not like this one. Now the important question: how does it look on the lips?? On its own, I wouldn't call it the most wearable lipstick around. The formula is great; very creamy and opaque, with that lovely vanilla scent. But it will take some getting used to when you look in the mirror for the first few times. I definitely don't find it ugly, but I can't quite imagine this being too flattering on anyone who isn't at least medium-fair in skin tone. If you are deeper than about NW30-NC35, this might really look weird. If you are very pale with minimal or no ruddiness in your skin this is likely to look quite beautiful. In an odd way. This is definitely a statement lip without having to be really loud. With that said, here's a picture of a smoky, monochromatic look featuring Chinchilla on NC25 skin. I've found this lipstick looks more "wearable" with muted cool-toned shades like greys, charcoals, and deep purples as these bring out the purple tones of the lipstick. If you want it to really look grey, pair it with stronger, or warmer shades as the lipstick will look even more muted in contrast. Topping it with a gloss will also make the shade a lot more wearable. 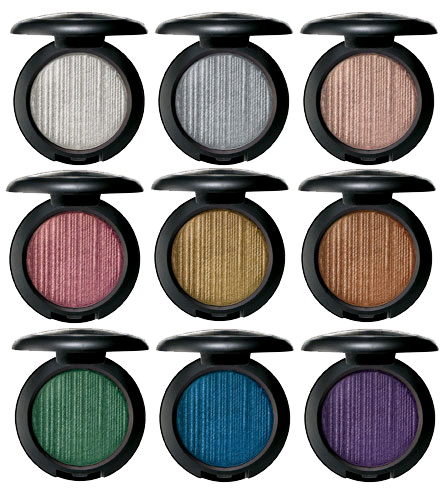 On lids: MAC Crystal eyeshadow, Shale eyeshadow, and Grape pigment. Definitely interesting, but I'll just stick with my more "conventional" Lime Crime colors (neon orange and electric pink) for everyday wear, though I will be pulling this out from time to time, and wondering if I just might have the guts to wear it out. The color is so unique as a lipstick that I can't really call the look beautiful or ugly. Maybe my mind can't grasp how lips could be that color, and is simultaneously attracted by the dusty lavender shade and repulsed by the alien-ness of the color worn on my lips. This look hinges on 2 things: A highly metallic liquid liner or pigment, and a set of very long, very spiky lashes. It's obviously not a subtle day look, but for night, it can be extremely dramatic. Step 1: Begin with a thick swatch of black liquid liner. If you're new to this, do 2 strokes the way I did below. (1) made by laying the brush along the curve of the lower lash line (tip pointing outwards) and gently setting it down along your upper lid. If your brush is very wet, you can either blot lightly on the back of your hand so that you don't get a big blob of black for your flick, or (2) you can first swipe the centre of your lids to get rid of excess first. This ensures that you have maximum control and precision when you do your outer flicks. Step 2: After the 2 lines, you can slowly connect the 2 outer points of the black lines earlier, curving gently to follow your lash line a little. When you are safisfied with the outer portion of the wing, continue into the inner corners last, just as your brush has the least amount of product left. This will give you the finest line possible, which is exactly what you want. Step 3: With a metallic liner or glitter liner (you can create your own like I did by mixing glitter sealant and a metallic bronze pigment/glitter) and a flat angled brush, draw a line diagonally from the outer most tip of the flick to the inner corners of your eyes. The line should be almost straight. Fill in the space between this and the black line, and then layer on more product to get an opaque, foiled metal strip along your lids. Step 4: Run the bronze along the outer halves of your bottom lashes, and then apply a strip of very long, spiky lashes. They should be shorter on the inner corners and longer on the outer so the overall look is still slightly cat eyed. I'm not using a super flared lash like the Eylure Nicola because that would obscure the dramatic wing. Place on the center of your lashes after the glue has dried at least 1-2 minutes, then firmly tuck the ends in. If you need, run over the base of the lash band with black liquid liner again, just to make sure there is no glue showing. Step 5: Run a pale yellow, white, or beige pencil along the inner rims of your lower lash line, and then apply black mascara to bottom lashes. These lashes can really obscure and darken your eye, closing them off and making them appear smaller, so adding this bit helps to brighten them up a little again. Step 6: To finish, I decided to go for a pale, milky pink (NYX Strawberry Milk Round Lipstick) on the lips and a hot pink flush (NYX Pinky) on the cheeks. By all means switch around to find colors you're comfortable with, because this eye goes with literally any lip shade. Is "wearable Goth" makeup an oxymoron? This is not really Goth in the modern sense of the word, but rather, pulls from the late-medieval Gothic age, with its strange blend of opulence and dark dramatism. It's not always about matching over-the-top black lips and eyes. Sometimes, beauty is as much what you do, as what you choose not to do. For this look which is inspired by Jordan Liberty, the eyes are extremely clean and more reminiscent of a 50s kitten eye than anything overtly "Goth", and the only touch of drama comes from the flicked liner and long flared lashes. The lips are the only thing that is slightly edgy about the look, blending black with a dark metallic purple for a 3D lip. To pull everything back so I don't look like a reanimated corpse, I threw in an intense pink flush on the cheeks for a doll-like twist. Step 1: Apply a matte beige to the lids, and a slightly warmer medium toned apricot (both from the Wet n Wild Greed Palette) to the outer halves of the socket line for very subtle definition. As we want the look to be very clean, the eye lids should not be discolored. Step 2: With a flat liner brush, apply black gel liner (Maybelline Lasting Drama) to the lids. As always, draw in the flick first, then the lash line. This allows you to really control the length and angle better. The finished liner should give your eyes a slightly exotic tilt but not be so thick or angled upwards that you look like you're channeling a Sophia Loren look. The outer edge angle of your lashes should follow the curve of your liner earlier. Step 4: Apply a hot pink blush (NYX Pinky) high on the cheeks. Pull it in further towards the center of your face than you would normally wear, just to give it a bit more of a doll-like look. And I hate to say this, but you CAN go a bit heavier than usual, as it needs to balance out the strong black lips. Step 5: This is the scary part. Use a black liner to rim the edges of your lips. If you have small lips like me, leaving the center of the cupids bow bare so you don't close off your whole mouth. Step 5: Fill in the outsides with black lipstick (L.A. Girl Creme Lipstick in Dreamer), and then run a dark metallic purple (Make Up Store Magic lipstick) in the center of the lips and blend outward slightly. If you can't find a dark purple metallic lipstick, the EASY way to do this is to dab MAC Grape pigment around the center of your lips and then press them together to distribute. Then apply a tiny touch of Vaseline or Rosebud Salve to return some shine without making the lip look glossy. If you've ever wondered about the fate of that gorgeous tube of bright, candy pink lipstick, you'll be glad to know it's been well-loved. It's no longer summer, but I still can't help whipping it out from time to time. There's nothing like a standout lipstick for looking "done" without spending a whole lot of time on your face. I'm using some shades from the Urban Decay 15 Year Anniversary Collection and The Body Shop, but feel free to use alternatives you own. Step 1: Apply a dark base to the lid, going up just above the socket line. This does not need to be very dark or opaque. You just need a base for shadow to cling to. Step 2: Apply a blue-violet shade to the outer edges of the black base, along the upper areas of the socket. Run along the lower lash line with a fine brush as well. Step 3: Pack the dark metallic grey to the lid under the purple. Smoke out the edges between the grey and purple so there are no harsh lines. Step 4: The fun part is applying a wash of iridescent green over the dark grey to transform the color. 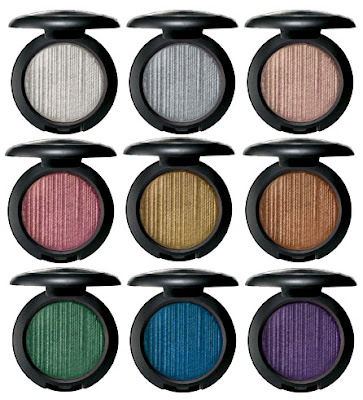 I used The Body Shop's Single Eyeshadow in #08 which is a white with a green sheen (similar in effect to MAC Vanilla or Pink Opal pigment) on the inner half of the grey shadow only. Reach around the inner corners to the bottom lash line slightly as well. The finished eye lid should look something like this, with green on the inner halves, dark grey on the outer halves, and soft purple framing everything. Step 5: Apply black kohl along the water line and black mascara on the top and bottom lashes. Voila!